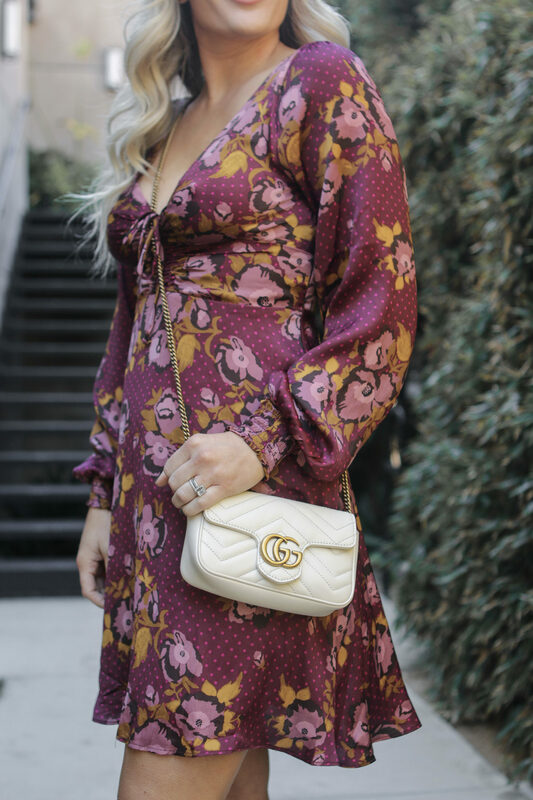 Just because there is an ever so slight chill in the air (yes I do realize that outside of Orange County it might be more than a slight chill), doesn’t mean you have to pack away those cute floral dresses during the winter! In fact, I keep my floral dresses front and center year round, and you should too! Here I am wearing the Free People Morning Light Mini Dress in the purple color option. As of right now it is price matched, and I just love the cute neckline it has! Today I wanted to share a few tips with you ladies on how to style your floral dress in winter time. It actually is not that complicated, and just involves cute layers that add texture and warmth to your floral dress look. Add a faux shearling or faux fur jacket! The pop of a more rugged texture actually ends up complimenting well with the sweet print on a floral dress. I am wearing this Calson Fleece Faux Shearling Jacket in my look. It is insanely soft, warm, and also comes in brown and navy. Wear boots or booties with your floral dress! A super easy way to winterize your floral dress is to wear winter shoes with it. Even wearing a warmer snow or winter boot with a floral dress can be such a cute look! I am wearing these Steve Madden Sock Booties in Burgundy in this look. I’ve mention it before, but just to echo, these are comfortable enough that I can wear them all day long! Tights baby! Warm up those legs! Whether your winter ranges from sheer, printed, or fleece lined tights-this is a fabulous way to style a floral dress for the winter season. I am not wearing any tights in my look above, but did just purchase these Gucci Interlocking G Black Tights to pair with my dresses during winter. Loving these tips on how to style a floral dress in the winter? Click here now for more of my essential fashion tips! !